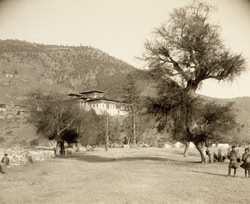 Photograph taken by John Claude White in 1905 at Paro in west Bhutan. This view is from the bank of the Paro Chhu river looking up towards the Dzong. This photograph was also reproduced in The National Geographic Magazine (April 1914) with the caption 'A good view of Paro Jong, with an enormous willow in the foreground. The large tree in the center is a weeping cypress. Our camp may be seen in the distance.' This is one of a set of photographs documenting a British expedition to Bhutan, led by White, to present the insignia of Knight Commander of the Indian Empire to Ugyen Wangchuk, the Penlop (Governor) of Trongsa in central Bhutan. The Penlop had aided the British when they wrested a favourable settlement from Tibet in 1904. The magnificent Paro Dzong, overlooking the Paro Chhu river from its hilltop site, is one of Bhutan's strongest and most important fortresses, and repelled several attacks from Tibet. Dzongs developed as fortified monasteries in Bhutan which performed military, administrative and religious functions by housing monastic communities as well as civil administration. Dzongs featured as far back as the 12th century in Bhutan, but many of the most famous and important surviving dzongs were built in the 17th century as part of a programme to strengthen the valleys from Tibetan invasions. The Paro Dzong is the symbolic centre of religious and secular affairs of the Paro Valley. The Penlop or Governor of Paro was a leader amid the feuding factions of Bhutan's chieftains in the 19th century, a rival to the powerful Penlop of Trongsa who eventually established sovereignty over the country.